I didn’t want to write this review. I’ve held off writing it because somehow, if I put what I’m thinking into words, it makes it all the more real. I’ve missed that window where it’s going to be relevant anyway. We’d been unable to get an early copy for review and Amazon didn’t ship my order on time. I suppose I can relent and give them that last one but more for the quality of the single player story than anything that the game contributed to the overall mythology of the Alien series. I won’t get into the whole debacle surrounding the development of Aliens: Colonial Marines but I will acknowledge that there seems to be some sort of saga around who developed what. Was it Gearbox, was it Timegate, did Sega know about all this? I’ll just talk about the game. Gearbox and Randy Pitchford had promised us an experience that would enhance our experience of the films. He had told us to expect a game that was an official, canonical sequel to Jim Cameron’s favourite Aliens. Colonial Marines opens with the Sulaco in orbit of LV-426, set 17 weeks after the end of Aliens. The last we saw the ship it was on its way past Fury 161, ejecting the EEV that contained Hicks, Ripley and Newt. So why is it back at LV-426? This promises to be an interesting mystery! We play as Corporal Winters, a Colonial Marine from the Sephora, sent to investigate a distress sent out by Corporal Hicks sometime during the end of Aliens. He is sent to the Sulaco and finds the ship infested with Aliens. Sometime since the end of Alien 3, the Sulaco has become a floating laboratory at the hands of Weyland-Yutani. Their mercenaries (PMCs) are as deeply rooted in the ship as the Aliens. As the campaign progresses, me and my ultimate squad of badasses (wrote for effect; the AI in this game makes your squad mates anything but badass, let alone ultimate) fight our way through the Sulaco, down onto the surface of LV-426 and into the remains of Hadley’s Hope, through a W-Y facility, into the Derelict and a final battle onboard another ship. I’m not sure where to start with this. Apparently the story was supposed to have been written by Bradley Thompson and David Weddle of Battlestar Galactica fame but it would seem the only evidence of that is the term nugget. 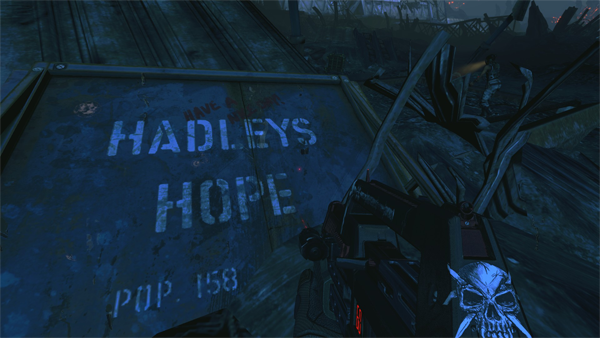 What we are given is a story that is full of inconsistencies (Hadley’s Hope still standing despite the massive nuke going off right beside it) and one track character motivation (“We never leave marines behind!”). What hurt it the most was that his inclusion in the story was completely shoe-horned. When asked how he could be alive, Hicks goes on to explain that Weyland-Yutani boarded the Sulaco prior to it passing Fury 161 and revived him. They intended to (and did) torture him for information regarding LV-426 and the Aliens. So…they decided to revive the Colonial Marine Corporal (who probably had training against this kind of thing) instead of, I don’t know, simply downloading the data from Bishop or torturing Ripley – the civilian who had more experience. Or better yet – revive them all. 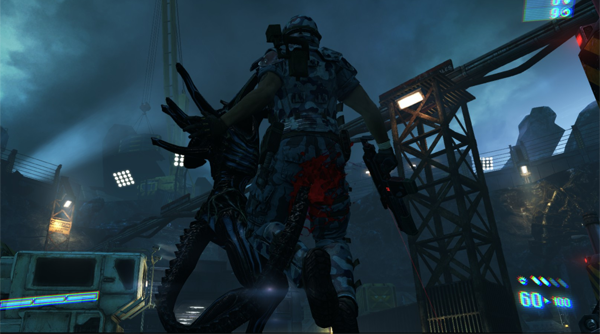 Upon his awakening, Hicks had a little bit of a firefight with the PMCs resulting in the fire that ejected the EEV (retconing the face-hugger). One of the characters asked who was in the EEV in his place and this is addressed with a throw-away comment of “that’s a longer story”. I groaned at this point. As is expected with Alien games we’re treated to a set of new variants in the Raven, Boiler, Spitter and Crusher. I liked that we got a different set of creatures as opposed to the traditionally used Praetorian or variants from the other games. These new creatures all seem mutated and different somehow. Good job I’ve been following the promotion and interviews because I know this is caused by radiation from the atmospheric processor explosion because it is not addressed at all in the narrative of the game. Instead what gamers are treated to are completely mutated appearances of the Aliens without a clue as to why they look so strange. I do like the designs and their concepts. I think the creepiest section of the single player campaign is when you are being chased through the sewers by the Raven, having to navigate your way, unarmed, through the Boilers. I thought it was genuinely creepy. The first time. This particular section also demonstrates the game’s lacking AI and dodgy animation on subsequent playthroughs. There are numerous videos and memes online showcasing un-exploding Boilers and their comical gait. This isn’t the only time either. Throughout the game you’re facing Aliens that will work their way right up to you and do nothing. Squad mates who will shoot at random directions, who won’t take cover. And then there are enemies that will simply run past you…Honestly…What on Earth happened here? I did really enjoy the sections aboard the Derelict. While all games seem to be keen to give us a the current generation version of Hadley’s Hope or a similar colony, we haven’t had a Space Jockey/Engineer location since Aliens vs. Predator 2 in 2001 and we haven’t been in the Derelict since that short section in Rebellion’s Aliens vs Predator (Classic) (that short boss fight in Aliens Infestation aside). Called the Origin in the game, we’re offered a short exploration of the ship which features a nice mixture of the Alien and Prometheus-style aesthetics. Given the love-it-hate-it nature of the recent film, I know many were worried about any possible connections. The only other connections are the inclusion of an occasional “pup”, the mapping device used by Fifield and an easter egg which shows a hologram of the Derelict engaged in a fight with another Jockey ship. And that little musical cue when you first enter the Pilot’s Chamber was wonderful. It genuinely brought a smile to my face. It was also so fun to explore the Sulaco. We never really had a chance to explore the ship in the movie and only Aliens: Infestation has given us a chance to traverse the ship. It’s common knowledge that Syd Mead helped them to design the rest of the Sulaco and it shows. The designs meld so nicely with what we saw in the movie. I really loved the chance to battle my way through the FTL engines and into the massive bridge of the warship. Let’s talk about one of my biggest irritations with the game: The cutscenes . They are absolutely abysmal. The lip sync is completely out and the facial animations and expressions are completely void. There is no emotion evident and it really pulls you out of the experience. There’s some replayability incentive in the collection of dogtags, legendary weapons and audio logs. The dogtags are just a collectable that unlocks an achievement, all featuring names of characters from the movie or people who worked on the game. The audio logs add some depth to the story (also adding to the confusing mess of the story) and are voiced by different characters and different actors. Collecting them all also unlocks an achievement. The more fun unlockables are the “legendary weapons”. These are supposed to be the weapons used by the characters from Aliens. You can find Hicks’ shotgun, Hudson’s pulse rifle, Frost’s flamethrower, Vasquez’s pistol, Gorman’s pistol, Drake’s smartgun. Some of these feature personalization not actually featured in the film (Hicks’ stencils on the shotgun and Hudson’s rifle firing bursts) that might irk some of the stricter fans. I’ve seen others criticise the game due to its length. I played through the game on the 3rd difficulty, initially and it probably took me around 6-7 hours to complete. This is pretty average for most games these days so I can’t really pin that as a major flaw of the game. The game isn’t very difficult, even on the hardest (Ultimate Badass) difficulty which can contribute to the short length. Multiplayer is the game’s saving grace. 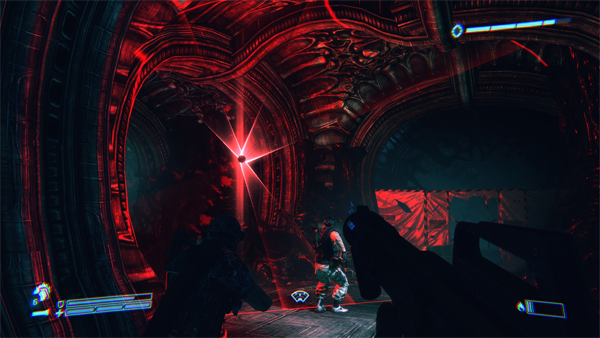 What I primarily wanted from Colonial Marines was an updated FPS experience. Having been spoiled with the likes of Battlefield 3, I was looking forward to customization, to multiplayer progression and a current game-style. To a small degree Colonial Marine does offer this. Whilst not as immersive or massive as Battlefield 3 (I’m still unlocking items in that game! ), we’re offered customisation that is unlocked through ranking up and completion of challenges. The majority of the weapon customisation can be unlocked via playing the single player campaign (you rank up in that) and by finding the Legendary Weapons. Your Colonial Marines’ appearance is completely customisable and you can select camouflage, armour graffiti, body appearance and etc. 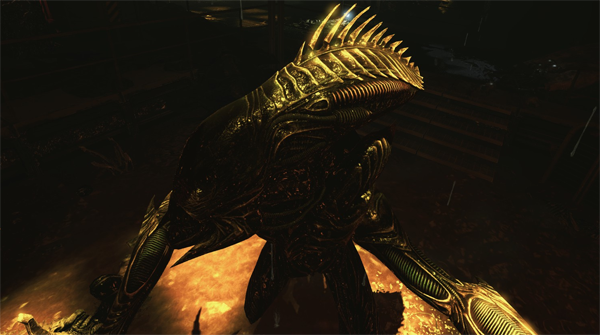 Your Alien character’s abilities and appearance is also customizable with all their abilities being unlocked by completing challenges and ranking up in multiplayer. The game ships with 4 game-modes and a decent selection of maps. All these maps are larger environment with smaller locations within each, offering a variety of gameplay styles. I’m disappointed that the game didn’t ship with a skirmish mode, instead opting to release it as downloadable content instead. This kind of business ploy can often be disenchanting for players. Multiplayer is immensely fun when playing with a party. The high points of your games come when communicating with your team – trying to setup ambushes as Aliens and coordinating your defences as a marine. Especially in the team based modes such as Escape or Survivor. These game modes really resonate with the feeling of Aliens as you battle your way from point to point in Escape or make your last stand in Survivor. But it also suffers from many of the same issues that the single player does with texture popping, graphics that don’t stand up to Alien vs Predator (2010)’s beautiful multiplayer locations, laughable animations and numerous bugs. A big complaint from players is in how the Alien character handles and I can definitely understand that. Whilst I think that the decision to make switch the camera to 3rd person is good in theory, the transitions between surfaces is very clunky and it is impossible to move with the speed and efficiency of the Alien in Rebellion’s flawed AvP. I really love the multiplayer, despite the flaws. I would love to see the bugs fixed and gameplay improved. I’m hoping the DLC will continue to provide more maps – Escape and Survivor only have 2 apiece at the minute and they are easily the highlights of the current game modes but variety will be needed to keep the fun. I’d love to finally get to have a multiplayer map set aboard the Derelict. Further customisation would be amazing too. Further weapon skins and maybe more unlockables such as different sights would really help deepen that immersion. 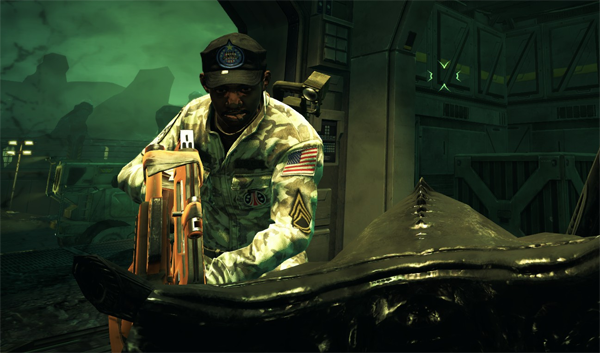 The co-op feature of Aliens: Colonial Marines were often spoke about and billed as an important selling point of the game. It features 4-player drop-in and out co-op. It’s fun – but for most of the wrong reasons. I played through the co-op campaign in a handful of hours with fellow staffer RidgeTop and a forum member. It was enjoyable but I think more for the banter and mocking of the game. You could argue that the co-op experience is always made by the people you’re playing with. The co-op obviously suffers through all the same issues that the campaign does but it’s just so fun to be able to mess around with friends. It’s definitely not the defining feature that Gearbox were selling it to be. Like I mentioned earlier, the multiplayer finally brings us a modern gameplay style that gels well with other FPS titles currently out. This style is obviously maintained within the single player campaign too. The customisation of weaponry is also featured across the game allowing you to use the same setups in single player. For the first time in an Aliens game we’re looking down iron-sights, we’re customising our underslung addition (I do love the underslung grenade launcher on my pulse rifle!) and we’re picking the logo splattered across our armour. These bits are fun. I’m really happy that the modern gameplay mechanics work so well with the franchise. I really enjoyed taking the motion tracker off the HUD too. Traditionally it has always been incorporated directly into the HUD but by bringing it off the HUD and making it an additional item that you carry and have to bring up at the expense of your weapon really adds to the immersion of the game. It’s especially fun in multiplayer with relaying the direction and distance to your team-mates. Graphically the game is very subpar. It can’t even begin to match the beauty of Rebellion’s Aliens vs. Predator that was released 3 years ago. I know that the X-Box is coming towards the end of its lifespan but with Halo 4 demonstrating that the console is still capable of providing beautiful, epic sceneries there’s really not much excuse as to why Aliens: Colonial Marines looks so bad. I won’t get into the whole scandal of the E3 demo vs the final product but Colonial Marines seems to boast none of the fantastic lighting effects and detailed scenery that was promised. The texture popping was very noticeable too. I’m used to games taking a short time to load the textures (Battlefield 3) but it is noticeably long in Colonial Marines and I found it very irritating. Sound-wise the game is fantastic. Kevin Riepl’s score is very brilliant and accompanies the series really well. Despite the odd use of some of the Alien Resurrection theme for the main menu track, Riepl brings in a large amount of brass military bravado to the score making it feel just like a Colonial Marines game should. I know Sega wants to release the soundtrack and I’d really like to see that happen as I would snap that up. Gearbox/Timegate had access to some of Fox’s Aliens resources and this carries over into the sound effects within the game. The pulse rifle sounds like it did in the film and the heart-beat tone of the motion tracker is also there. I don’t think I could possibly pick a single fault with the sound aspect of the game. I purchased the Collector’s Edition of the game. This is not something I typically do as I find that the extra goodies you get with the game tend to be subpar, particularly busts or statues that are included. I never brought the fancy version of the Alien Anthology because the bust looked nowhere near as impressive as in the concept images released. Thankfully the power-loader statue that came with Colonial Marines does look really good and makes a really cool addition to any collection. The Collector’s Edition also comes with additional downloadable content in way of multiplayer skins, exclusive weapons and equipment and an additional map. 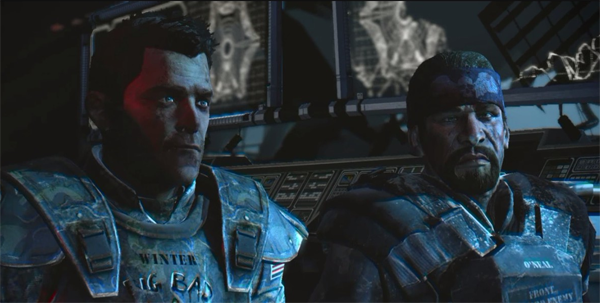 The skins are all based on characters from Aliens: Corporal Hicks, Sergeant Apone, Private Drake and Hudson. Aside from Hudson, all include quips and taunts voiced by the original actors but even Hudson’s voice actor sounds immensely “Hudson-like”. The likeness is good enough considering the graphical standard of the game and they look exactly like who they are supposed to be. It’s really cool to be able to run around looking like Corporal Hicks and hearing Michael Biehn’s voice in multiplayer. Also included is “Ripley’s Pulse Rifle/Flamethrower”, the duct-taped combo that Ripley storms into the hive with in Aliens. I’ve got to admit, it puts a bit of a grin on your face rocking around with this thing. There’s also the phased plasma rifle, what was a throwaway comment in the movie, put into existence in the form of this one-shot kill wonder weapon. It takes time to charge up and then fires a beam of energy that obliterates whatever it hits. This is a pretty fun weapon. Another piece of DLC equipment is the “sonic-electronic-ball-breakers”, another throwaway comment that Gearbox/Timegate took and ran with. They’re grenades that jump and emit a pulse of energy that stuns anything within a small radius. They’re actually pretty useful and fun. The last item of DLC we have is the shooting range. It’s a small map based within the Sulaco that lets you test your loadouts against a series of shooting targets. It’s fun but nothing special. I’ve only used it the once to see what it was like. And to round off the Collector’s Edition, we’re also treated to a “dossier” which contains a blueprint of the Sulaco (cool), security image from Hadley’s Hope (lame) and a graduation certificate (kinda alright). I quite like the DLC and the statue but aside from that I do regret paying full retail for this. 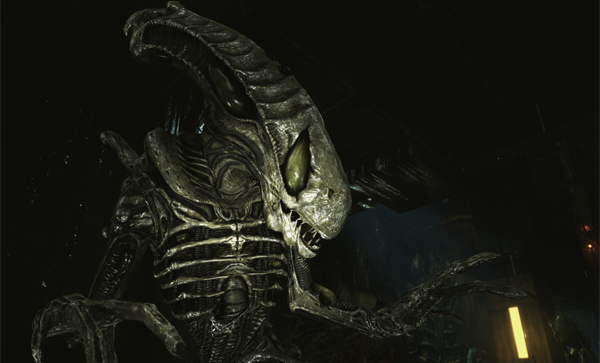 There’s no escaping the fact that Aliens: Colonial Marines is a bitter disappointment. However, it’s not the offensive gaming experience that everyone has been cursing about. Gearbox, Timegate, whoever, simply failed to deliver the experience that was promised. Instead we got the privilege of a 6 year wait for a buggy game. Despite the fact that I’m really enjoying the multiplayer I can’t, in good conscience, recommend people pay full retail price just for a multiplayer experience. If you can get it really cheap then by all means pick it up. However, I wouldn’t be surprised if Sega drops support and leaves us with this mess of a game which really saddens me. We finally have an up-to-date Aliens gaming experience and it’s buggy and most likely will be dropped ASAP. We’re guaranteed 4 DLC packs and I hope we get a Derelict level and more customization options but I honestly think this game will quickly lose its player-base unless it is patched and soon. I can’t get over how disappointing this game really is. How let down I feel by Sega, by Gearbox. I feel ripped off. From Aaron Percival here at AvPGalaxy, I am immensely disappointed to have to give Aliens: Colonial Marines a 2 out of 5. Disclaimer – All images used in this review came from the community screenshots page for Aliens: Colonial Marines on Steam. I think an important update should be made to this review. The update being that if you fix a simple typo inside the .ini files on Colonial Marines all of the AI issues are resolved and the combat works as intended. I can’t include a link as a guest but if you simple Google “Aliens Colonial Marines fixed” youll find your answers.